﻿ Bodyboarder International Magazine - Live! Bodyboarder International Magazine - Live! For Bodyboarders – By Bodyboarders – A website and podcast about the sport and people of bodyboarding. Bodyboarder International Magazine also known as BIM was established in 1991 and was around throughout the early 90′s with Patti Serrano at the helm. In 2007 BIM became Bodyboarder International Magazine – Live! with live weekly podcasts and a look at what’s happening with the people and sport of Bodyboarding. It’s now 2010 and BIM has new owners – Lisa Smith and Allison Cohen who bring a combination of over 30 years of internet and bodyboarding experience together to create a whole new online experience for bodyboarders everywhere. 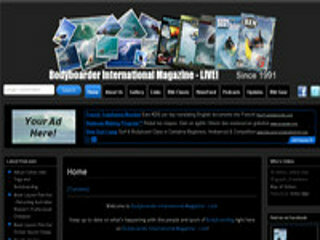 The website of Bodyboarder International Magazine - Live! no longer exists, sorry ! Bodyboarder International Magazine - Live! , belonging to category "e-magazine"
Related sites Bodyboarder International Magazine - Live!